The Turetsky Men's Choir was established at the Moscow Choral Synagogue. The chorus made its debut in 1990 with Jewish liturgical and folk music in the philharmonic halls of Tallinn and Kaliningrad. Their repertoire has grown since to include opera, spiritual, folk and pop music in ten different languages. 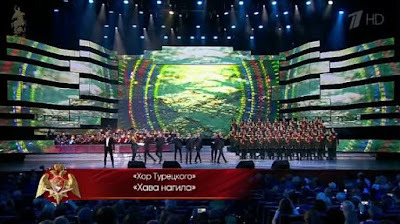 It has been a vehicle throughout Russia for renewed interest in Jewish heritage, having resurrected music that had been near extinction since 1917 is and is now a staple throughout Russia's synagogues. In his blog "Teruah Jewish Music" Jack Zaientz wrote, "I don't know if any of the choir members, including Turetsky, are Jewish or what being Jewish might mean to them ... And I'm not sure how much it matters. Seeing a bunch of seriously good male vocalists singing Jewish music to a huge crowd of Russians, in the face of the centuries of discrimination that Russian Jews have faced, does my heart proud." Here is the Turetsky Men's Choir in a rousing rendition of Hava Nagila -- the 71st version that we've posted so far on Jewish Humor Central.